Social safety net in ancient China? The more I learn about ancient China, the more my respect grows for the Middle Kingdom and its amazing history. Here is something written by a 9th century Muslim traveler, Abu Zayd al-Sirafi, who visited China during the Tang Dynasty, in 850 A.D. or thereabouts. I found a modern translation that I first came across so incredible, I searched for corroboration. 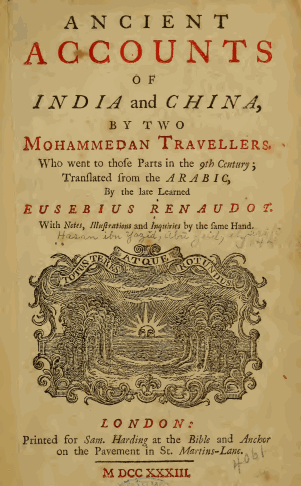 I then came across this 1733 English translation (if I interpret the cover page correctly, by an unnamed English translator using a French translation from the Arabic by Eusebius Renaudot). “The Chinese have a Stone ten Cubits high, erected in the public Squares, and on this Stone are graved the Names of all sorts of Medicines, with the exact rates of each; and when the poor stand in need of any Relief from Physic, they go to the Treasury, where they receive the Price each Medicine is rated at. “There is no Land Tax in China; they only levy so much per Head, according to the Wealth and Possessions of the Subject. When a Male Child is born, his Name is immediately entered into the King’s Books, and when this Child has attained his eighteenth Year, he begins to pay for his Head; but they demand it not of the Man who has seen his eightieth Year; on the contrary he receives a Gratification, by way of Pension, from the public Treasury; and in doing this, the Chinese say, That they give him this Gratification in his old days, in acknowledgment for what they receiv’d of him when he was young. This text was written nearly 1,200 years ago. It took another millennium before public education become the norm in more developed European nations, and at least another century before various forms of social security and public health institutions took root. I am beginning to appreciate more and more why the Middle Kingdom viewed the period loosely demarcated by the Opium Wars of the 1850s and the Japanese occupation of the 1930s and 1940s as the Century of Humiliation; and why it might appear to many that the recent rise of China as an economic superpower only means a return to the way things were always supposed to be, the way things have been for several millennia preceding the rapid rise of Europe a few centuries ago.